It is a good news that we can enable https or SSL certificate in Blogger custom domain. One of the weakness of using Blogger platform was the lack of SSL certificate or HTTPS protocol in custom domain. Blogger that is using custom domain can not use HTTPS redirect in their website address. Now it has changed. We can enable HTTPS in Blogger custom domain. Currently there are two ways to enable HTTPS in Blogger custom domain. The first one is using Cloudfare CDN service and the second one is using draft.blogger.com. I preferred to use draft.blogger.com to enable HTTPS in Blogger custom domain since it is very easy. All you need is just 2 clicks. I'm not kidding, the steps taken to configure the SSL certificate in Blogger custom domain is merely just 2 clicks. Before we go through the detail step, there are several things that need to be understand. The draft.blogger.com is a back door for testing the beta feature of Blogger. The HTTPS protocol is still not available in normal Blogger dashboard. The team are testing this feature and plan to release it officially latter on. I don't know when they will release this feature officially. If you want to wait this feature available in normal Blogger dashboard so don't use this way and keep HTTP protocol on your blog. For my self, i will take the opportunity to taste this feature earlier before the official release. Below is step by step to enable HTTPS or SSL certificate in Blogger custom domain. Below is the illustration of every step how to enable HTTPS (SSL) in Blogger with custom domain. We have to use draft.blogger.com to show the option HTTPS availability. In normal Blogger dashboard Setting | Basic, we can only see the information that HTTPS is not available in custom domain. Below is the warning message when we want to use HTTP redirect for Blogger with custom domain. Warning message in Blogspot when we confiure HTTPS redirect "warning: https is currently not available for custom domain blogs." On draft.blogger.com dashboard we can see in Setting | Basic the option of HTTPS availability as shown in the picture below. There is additional column on draft.blogger.com, above the HTTPS redirect we can see HTTPS availability. The default setting is no. W need to change this to Yes. We need to change the HTTPS availability from No to Yes. There will be message that said the HTTPS is not available. Just wait a few moment and refresh the page. You will find that the HTTPS redirect now become available. Just change the HTTPS redirect from No to Yes. 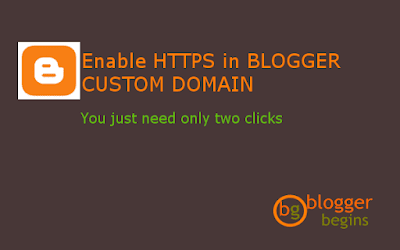 Your Blogger custom domain already run in HTTPS. Google has been used HTTPS as ranking signal officially since August, 2014. The idea is, Google want the web that is coming in their search result are safe for the user. In other word, Google will consider that the blog that is not run in HTTPS is not safe. So by using HTTPS will help our blog rank better in Google search. The blog that use HTTPS also looks more professional since this protocol has been used many years in website that demand high security like bank and online shopping. HTTPS will help our blog rank better in Google search. Switching from HTTP to HTTPS will have impact on the SERP result. One thing that we can see is the Google search result will shows a HTTPS url. It means Google will index every page and put the HTTPS as search result. Some people said that it will reduce the blog traffic for a while. We can see the URL on Google search of our blog that has been redirect to HTTPS now using HTTPS in its URL. So,..have you change your blog to HTTPS? Please share your experience so we can learn together. As an update for this article, since May 2018 Blogger has errolled this feature in their official dasboard. Right now you don't need to use draft.blogger.com to enabled HTTPS for Blogger with customs domain. Cheers. 6 Responses to "Enable HTTPS in Blogger custom domain"
Hi Nomi, As you can see that my blog are using https. I used the step by step listed in this post. I have followed all your steps but I still don't have the green secure sign before my address. Just still an i sign. Do you know what is causing this? Thanks and hope to hear from you soon!